These feet walked over 300 kilometers for safety, food, and water. Will you walk with her? I had intended to write my reflections from my Horn of Africa assessment trip immediately after I returned. I wanted to but I couldn’t. There was too much to process. First, let me encourage you to please read a post I wrote earlier entitled, “Africa is beautiful: The danger of how we frame the story of other people and nations.” I want to make sure that I don’t perpetuate this monolithic perspective where people only think of poverty as synonymous with Africa. Now, I’m not a newbie to travels to difficult areas of the world. As part of my work as the founder and visionary of One Day’s Wages, I’ve seen my share of suffering and pain. 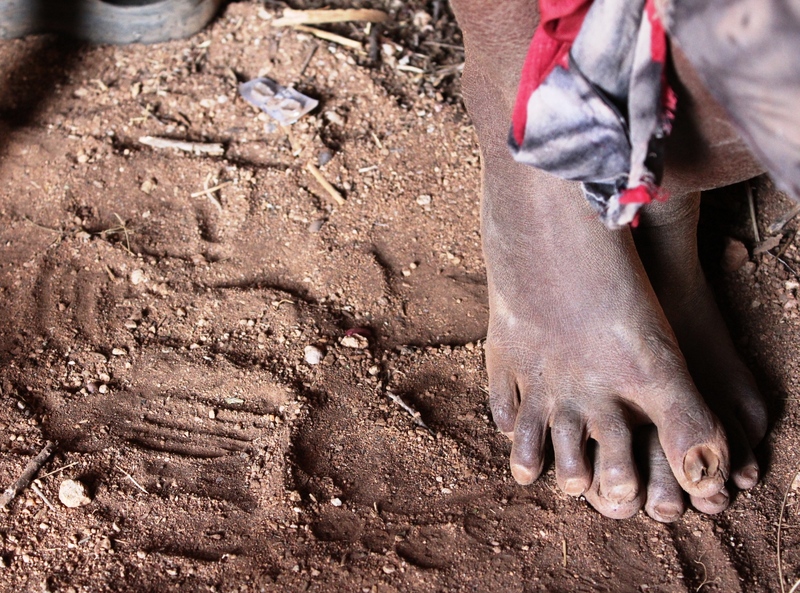 But the image that stood out the most for me from this trip were these feet (above). [You can click it to see the high-res picture]. These feet belong to a woman named Sahara. Through our translator, I received permission to share her story. Sahara and those two feet traveled 300 kilometers (a little under 200 miles) – some by cart and some by foot – as they sought to escape the worst drought that has impacted East Africa (Kenya, Somalia, and Ethiopia) in the past 60 years. She traveled about 200 miles on cart and foot. She did not travel alone. She traveled with her husband who I was not able to meet because he was staying with one of his other wives in this polygamist community. She did not travel alone. She also traveled with her six children – the youngest being about 1 and the oldest being around 8. She had just given birth to her sixth child when they began her journey. Her youngest was severely malnourished when they arrived to this new settlement in a town called Benane. Her children – all six of them – survived this journey. According to some organizations and resources, her children were fortunate. 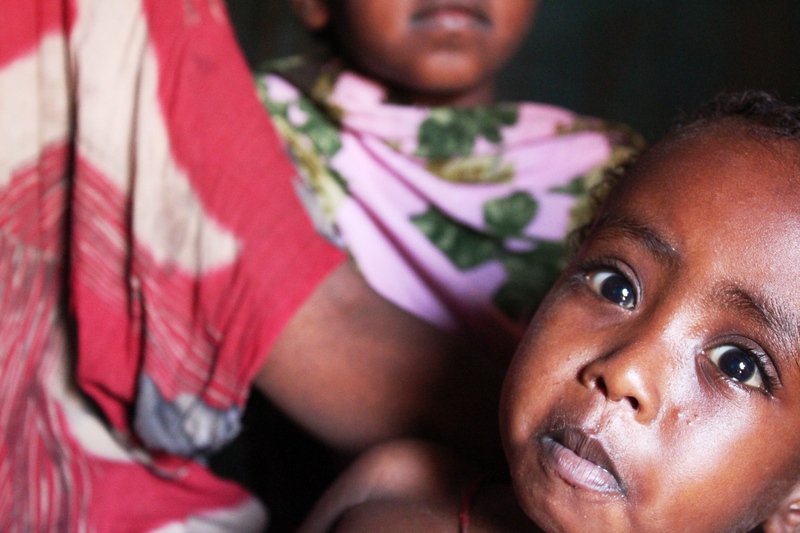 It is estimated that over 30,000 children died as they traveled for safety, food, aid, and water – most taking place in Somalia. 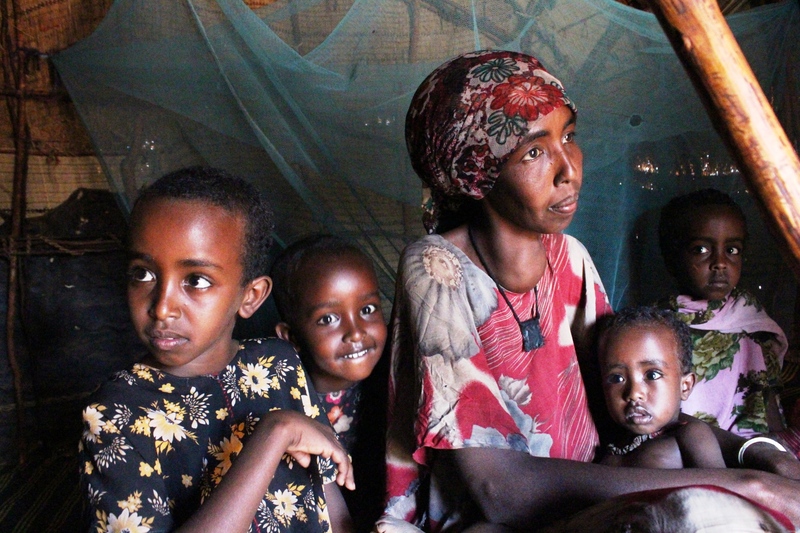 Her children survived but couple were severely malnourished – especially her youngest child – who she just gave birth to before they embarked on this 200 mile journey. 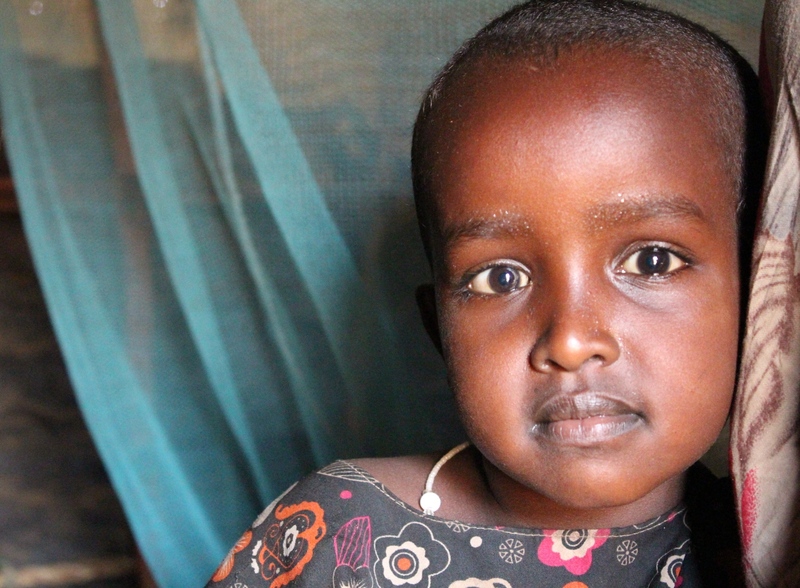 Through aid and relief work, food vouchers and rations have helped this young baby progress in her health. When I checked her health with a local NGO workers/nurse, the baby was now only “moderately malnourished”. Sahara has personal medical issues that she’ll likely not able to get assistance for. One of the first things I noticed in my conversation with her was the large lump in her throat. As not to embarrass her but I did not ask her for the details but I fear that it may be a large cancerous tumor. This family lost nearly all of their livestock which included, in her estimation, 100 cows, 100 goats, and 100 camels. They were now left with…one goat. For such a pastoralist community (livestock and grazing dependent), this crisis was life changing. This family – like so many – lost everything. Aid, relief work, and development are always complex and messy. Anyone that tells you different is lying, selling something, doesn’t know what they’re talking about, and/or all of the above. But in spending a work – traveling with other relief workers – and hosted by one of our Horn of Africa partner, World Concern, I can assure you that – in the midst of pain, tragedy, and a lot of complexities and messiness – lives are being impacted and empowered. I am humbled that so many gave generously to ODW’s Horn of Africa Fund. From United Nations’ recent report on the Horn of Africa, progress has certainly been made. At its peak, over 13 million people were impacted by this crisis. The “worse” is over but as the world turns its attention to other events, we forget that there’s still a deep humanitarian need. In fact, about 9.1 million people are still in need of assistance. Pray for the situation and for those affected. Pray for the relief workers that are on the ground. Please help share this story – far and wide. As you’re able, convicted, or led, I want to invite you to consider giving to the relief and rebuilding work via ODW’s Horn of Africa Relief Fund. 100% of your donations (minus credit card fees) will go to support our NGO partners (World Concern, Adeso, and Concern Worldwide). You can give a donation, donate your upcoming birthday to this fund, start an Idea for a Cause, create a church or group campaign, etc. Will you walk with those who are suffering? For some reason, I was drawn to Sahara’s feet. Not instantly but when she shared that she had traveled about 300 kilometers, I was drawn to her feet. Perhaps…as a reminder to commiserate what it must have felt to be in her shoes or rather… feet. It’s not guilt, fear, or shame…but I invite you to join me in walking with those who are suffering around the world. * Sahara was generous in welcoming me and my colleagues to her home. They lost everything and so resources like blankets, malaria nets, cookies supplies, jerry cans, etc. were supplied through our NGO partners. Food vouchers and access to water and medicine were also made accessible. Previous Africa is beautiful: The danger of how we frame the story of other nations and people. Next Pointing our children to Jesus – with words, affection, and actions. One of those greatest days of my life. Pastor Eugene, Thank you so much for taking the time to share. So humbling, so convicting. really appreciate your prayers and support. thanks so much for journeying with us. I, myself, have never traveled to Africa or other third-world areas of the world, but I’ve always wanted to, and your blog post just deepens that desire. Sahara’s story is inspiring and sad, and one that I’ll be sure to share with fellow ministers and friends and family members alike. Thank you so much for taking the time to share her story—and thanks to Sahara for sharing her struggles. you welcome and thank you. While you made a nod to not wanting to perpetuate the stereotype that Africa is a continent of poverty, your subsequent story does exactly that. And your earlier post, while featuring some lovely photos and a discussion of the strength of community values, also perpetuates another stereotype, the stereotype that the continent is “beautiful” but troubled. May I suggest your next trip to the continent – and some of your reading in the meantime – focus on the incredible economic growth that many parts of sub-Saharan Africa has seen in the face of a worldwide economic downturn? If you want to think about some of the nuances and ways to pray for African economic growth, you might want to look at this interesting Economist article talking about the strengths and weaknesses of African entrepreneurs: http://www.economist.com/node/21557373. And to hear about the strengths of African businesspeople, check out this one from the Harvard Business Review: http://blogs.hbr.org/cs/2012/03/what_africas_entrepreneurs_can.html. Check out Walk 4 Water on Facebook. My friend Amy and some others are walking across Africa for women like Sahara.